An impressive Combined Passing Out Parade (CPOP) took place at Air Force Station Tambaram today (21 Apr 17). A total of 462 Air warriors were inducted into the main Steam of Indian Air Force and one foreign trainees from Nepal also passed out successfully on the occasion. The Air Warriors went through rigorous and intensive training at the two premier institutes of the base, namely, the Mechanical Training Institute (MTI) and the Workshop Training Institute (WTI), before passing out. The Mechanical Training Institute (MTI) was awarded the prestigious 'President's Colours', on the 03rd Mar 2017, the only Airmen Training Institution to have this distinction. Air Vice Marshal VC Wankhede, Senior Maintenance Staff Officer, Headquarters Training Command, Indian Air Force reviewed the parade. He was received by Group Captain CA Somiah, Commanding Officer, Workshop Training Institute and Group Captain A Arunachaleswaran, Commanding Officer, Mechanical Training Institute. The occasion was also graced by Air Commodore S Shrinivas, Air Officer Commanding, Air Force Station, Tambaram. The passing out trainees were also administered an Oath / Affirmation on Joining the Air Force fraternity. Addressing the newly inducted 'Air Warriors', the Reviewing Officer complimented them on their immaculate turn-out and impressive drill movements. He further added that the Air Warriors must strive for professional excellence. He also brought out that, with the induction of State-of-the-art aircraft, equipment and weapon systems, the Indian Air Force was witnessing major changes in operational philosophy and today is on the path of transforming itself into a strategic force of great caliber. He urged the Air Warriors to make sustained efforts towards continuous enhancement of their technical knowledge and skills by keeping themselves abreast with the latest developments. He exhorted the Air warriors to maintain exemplary conduct at all times, in keeping with the ethos of the service. The parade culminated with the presentation of awards & trophies to meritorious trainees and an impressive display of Continuity Drill by the passing out Air Warriors. The 'Best All-Rounder Trophy' was awarded to LAC Vipin Kumar Taliyan, Propulsion Fitter of Mechanical Training Institute and LAC Shivam Saxena, ESSA (SEW) of Workshop Training Institute. On 21st Apr 2017, 107 trainees of Automobile Fitter trade intake-34 at Mechanical Transport Training Institute (MTTI), successfully completed their training. To mark the culmination of their training, a ceremonial Passing Out Parade was held today (21 Apr 2017) at Air Force Station, Avadi. Air Commodore KK Biswas, Chief Instructor (Ground), Air Force Academy Hyderabad, was the Reviewing Officer for the Parade. He was received by Group Captain PV Pawar, Commanding Officer, Mechanical Transport Training Institute, Air Force. The Chief Guest reviewed the parade and presented Trophies to the meritorious trainee airmen. Addressing the parade, the Chief Guest emphasized upon the trainees to ensure optimum contribution by each of them towards the service. To achieve this, a sound foundation has been laid at Training Institute and this would help them in becoming true air warriors. 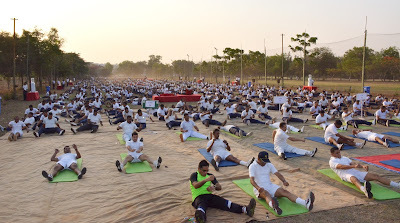 Trainees performed a yoga demonstration, which was followed by a dazzling display of Gypsy drill wherein the ab-initio trainees demonstrated their skills of dismantling and re-assembling a Maruti Gypsy in less than 5 minutes. This was followed by unarmed combat demonstration. All the trainees were smartly turned out and impressed every one with perfect drill movements. 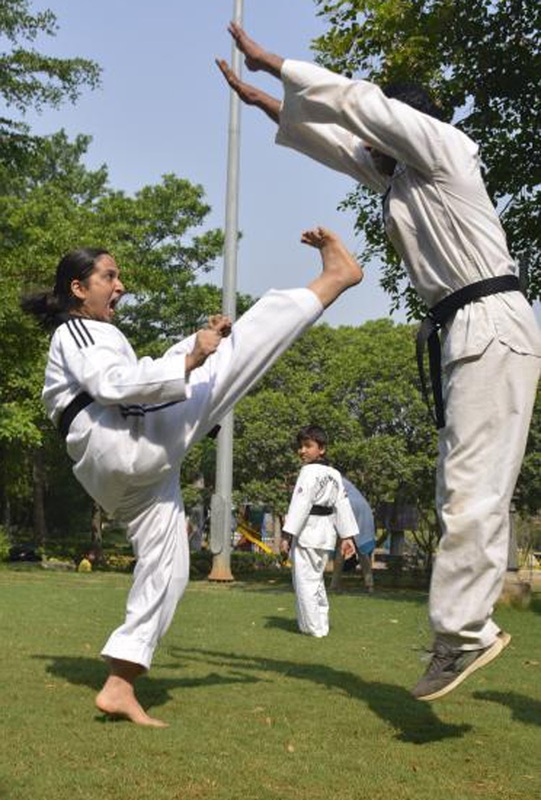 1EME Centre & Artillery Centre Celebrated “International Day of Sports For Development & Peace"
“International Day of Sports for Development & Peace” and “World Health Day” month of United Nations, both for the year 2017 was celebrated at 1EME Centre and Artillery Centre at Secunderabad/Hyderabad in this month to promote Taekwondo and Martial arts, Physical fitness. The WHO theme for this year was to ‘Fight Depression’. At both the above Centres, the event was simultaneously commemorated by doing physical fitness exercises. An overall total record number of 2305 Persons participated (1765 from 1EME Centre) in this event and achieved a “High Range Book of World Record for the largest simultaneous participation on the occasion”. The event was conducted at 1EME Centre by Brigadier Ajay Malik, Commandant and at Artillery Centre by Brigadier Rohit Butalia, Commandant with the support of Dr Jayanth Reddy, Founder & MD of JR International Taekwondo Academy, Hyderabad and under the overall coordination of Lieutenant Colonel Sunil Uniyal and Mrs Kiran Uniyal.